New York - Right before Rosh hashana of 5772, Rav Menashe Klein was niftar. He was a remarkably prolific writer, having penned two entire series of Teshuvos, numbering into the thousands. He carried on correspondences with the Steipler Gaon zatzal, who had enormous regard for him. Rav Elyashiv too, gave him tremendous respect whenever Rav Menashe went to visit. He was born in 1924 in Europe. Originally hailing from the town of Ungvar in what was then Czechoslovakia and what is now the Ukraine, Rav Menashe survived the Nazis, Yimach Shmam. In the DP camps as a young man he strengthened people and he taught Torah. He strengthened shattered men and women, and encouraged them – fortifying them with the means to continue. To the older boys he taught Chumash and Rashi. To the younger boys, orphans, he taught Aleph Bais. One of them later grew up to become the chief Rabbi of Israel – Rabbi Yisroel Meir Lau Shlita. Recently, I asked Rav Lau about Rabbi Klein. He remembered him vividly and fondly, asking me to send regards. Rav Menashe’s love for his fellow Jews was profound, one could tell it in his eyes. Once a couple experiencing enormous distress on account of their son went to see him. Rav Menahseh spent hours with them comforting them, strengthening them and inspiring them. They left his presence recharged, and since them, I have never seen them down. He would cry with parents whose children were on the verge of an intermarriage. He would daven fervently for anyone who was sick or ill, and of late, whenever Bnei Torah would come to visit him, he would ask them to have him in their Tefilos – giving them his name and that of his mother. He studied under the Ungvar Rov Rabbi Yossef Elimelech Khan and then after the war he came to the United States. He considered the Klausenberger Rebbe zatzal his Rebbe Muvhak. He received his mehalech in learning and in Psak from him. He learned in the Klausenberg Yeshiva when it was in the Bronx, after the war. It was called Yeshiva Sheris HaPleita. His hasmadah was legendary. He would write responsa well into the wee hours of the morning. He knew Shas and reviewed it constantly. He had an explanation of virtually every Tosfos on the tip of his tongue. One can see from his responsa his grasp of the Talmud. His Seforim are filled with innovative, insightful, and brilliant chiddushim. He wrote Seforim on Chanukah, Yevamos, and numerous other topics as well. His responsa dealt with almost every issue one can think about. Often Rav Menashe is the only Posaik that will discuss an esoteric halachic subject. He carried on a halachic discourse with numerous Poskim and luminaries. The Lubavitcher Rebbe carried on halachic conversations with him, as did numerous others. He also had a warm and genuine laugh, a twinkle in his eye, and a good sense of humor. Once I had asked him about whether there was any stringency in changing a baby with the same hand that one wraps the Tefillin straps. He responded, “By unzer, it is the froi who change babies, so it is nisht ken Shailah. He laughed and then answered the question based upon the various textual variations in the text of the Gemorah. He loved Kollel Yungeleit and Bnei Torah. Once he saw a Ben Torah who could not afford Seforim but showd interest in what he wrote. Rav Menashe piled him with Seforim before the young man left. He carried on conversations and discussions with others as well, many holocaust survivors. Indeed, he even carried on a chevrusashcaft with Elie Weisel for a number of years. Rav Menashe would type his responsa on a computer well into his 80’s. He inspired many others to learn computers as well, at an advanced age. I had once convinced Rav Dovid Kviat zatzal to learn how to write his Chiddushim on the computer. When he heard that Rav Menashe had done so, he did as well. He allowed his responsa to be published in Bar Illan’s Responsa project and was very generous with allowing the reproduction of his Divrei Torah. Many of his positions of course were remarkably conservative in halacha too. He did not hold of translations of Shas. He disagreed with rendering rulings over the telephone – especially if the Rav did not have a phone number to call back. What will the Rav do if he realizes that he made a mistake? His halachic positions were certainly innovative too, if not also controversial. He never recited a bracha on tovelling dishes for fear that the manufacturers were really Jews. Even if there is a majority, how do we really know? Some of his other positions were even more controversial. He held that giving blood may be a violation of Chovel B’Atzmo. He was the first to argue with Rav Moshe Feinstein zatzal about an Eiruv in Brooklyn. Many a Yeshiva bochur disagreed with his position about street lights acting as a legal type of fence, but all admitted that it was innovative. He also held that Mitzvos cease after one’s death and one does not have the right to give away organs – even if it is Pikuach Nefesh. Rav Menashe would spend many months out of the year in Eretz Yisroel in Kiryat Ungvar in Ramot. In America, his Yeshiva and Shul was at 16th Avenue and 52nd Street in Borough Park. He was a warm, loving Posaik, who inspired tens of thousands with his hasmada, his dedication to Torah and his steadfastness in halacha. Within the past year and a half he handed over his Yeshiva and Shul to his son, Reb Amram, a tremendous Talmid Chochom and Baal Middos too. May he be a Mailitz Yosher for all of Klal Yisroel. "HAMAKOM YENACHEM ESCHEM B'SOCH SH"AR AVEILEI ZION V'YERUSHALAYIM"
May the new year be a Shnas Brocho V'Hatzlocho, Refuah V'Nechama, Geula V'Yeshuah. There's no need in labeling R' menashe z"l as the leading posek, when it's simply not true. Was he a posek? Definetly. The leading posek? Certainly not. In addition, reb yair fgails to mention how dedicated he was to preserve the memory of the holacaust and the 6 million yidden who were killed hy"d. As it's known that on the roof of his shul in boro park there are six lights in memory of the six million neshomas. Baruch Dayan HaEmes--may he be a meilitz yosher for klal yisroel. Approximately 12/13 years ago I went to R' Menaseh for a bracha and halachic guidance. He showed true concern and feeling for my situation and was ready to make several phonecalls on my behalf. I also spoke with him about his sefarim and how much I enjoyed them. He asked me if I wanted to buy some of them and I answered that I did indeed want to - but couldn't afford them at the time. Before I knew it, I walked out of his study with a huge and expensive pile of sefarim. Incidentally, that was the first time I ever spoke with him (aside from my giving him shalom at 2 or 3 weddings in prior years). He certainly did not know me from before then. But I can vividly recall walking away feeling inspired, uplifted, and ready to tackle any major challenge. The writers never write their own headlines. I'll admit I'm not familiar with all of the chashuve rabbonim but I'm reasonably confident I've heard of most of them. Yet, to label this Rabbi Klein as the greatest posek in the world today seems to be a bit of hyperoble. I'm certain, as Rabbi Hoffman describes he was a prolific writer, but judging by the few anecdotes he recites in the article, Rabbi Klein is far from the world's greatest posek. In any event, may his memory be a bracha for all of klal yisroel in the new year. “ There's no need in labeling R' menashe z"l as the leading posek, when it's simply not true. Was he a posek? Definetly. The leading posek? Certainly not. Ungvarer Rav was the leading Posek and Gaon in our generation. The above was the opinion of the Steipler Gaon, Rav Moshe Feinstein and Harav Elyashiv Shlit"a. This is unfortunately one of the biggest losses Klal Yisroel had in the last twenty or so years. May Hashem be menachem Klal Yisroel. All hassidic sects and their dayanim in boro park treated him as the chacham zakein of the entire neighborhood and felt they needed to answer to him. Thats a pretty good haskama to be called a leading posek. Being a "chacham zakein" (aka an elderly knowledgeable individual) does not transform a rabbi into the top expert on jewish law but his death is clearly a loss for klal yisroel, whatever ranking he held. If anyone wants to give last Koved to the Tzadik, there will be a Slichos at 12:45 AM followed by a live hookup of the Leviya at 2:00 AM at the Ungvar Bais Medrish he built in Brooklyn (5306-16 Avenue). According to you one might think that rav mosheand rav elyashiv sent their complicated shalos to the ungvarer rav. Interesting because I used to live on his block (53 bet 15 & 16) and he was always available when I had a shaale. I seldomly saw other people whenever I went to him. I once heard that in addition to his greatness in torah he was also very knowledgable in secular studies since he was a college graduate. Would anybody be able to confirm this? He was never a college graduate and he was not terribly knowledgeable in secular studies..He was an outstanding talmid chochom. He never went to a secular college.....pleeeze, stop with these stories that have no basis in fact. The rav was a great tzadik as well as being knowledgeable in halacha but lets stop making every rav from the alte heim who is niftar into the gadol hador. If you google the term "gadol hador" you will literally find dozens of rabbonim with this designation. Every rav with a shtieble in BP or willy is not a gadol hador, no matter how beloved he may be to his chassidim. 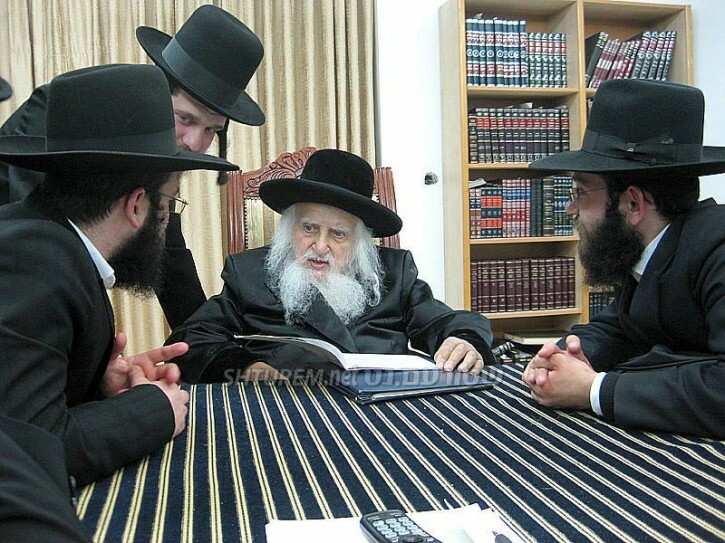 Rav Moshe ztk"l considered him the leading posaik of our generation? Any chance you can cite where he wrote that? Nebach, a yid should speak to another yid that way on erev rosh hashanah. One of Rav Moshe's closest talmidim? Who do you fantasize you are kidding with that one. His k'hilla in Boro Park was on 16th Ave between 53 & 54 Streets. Its the one with the 'Jerusalem Stone' front. Are you talking about Rabbi Moses Feinstein or some other "rav moshe"?? This is getting silly. Its highly doubtful that Rabbi Feinstein characterized him as the greatest mind of the generation, as the "gadol hador" (whatever that means these days), etc. These overstatements do not do kavod to the deceased. Thanks for the M'kor from Reb Moshe. it is always good to hear something from a Kli Shieni, something that Reb Moshe said. It is Fahr Rosh Hashono, and we are able to do is argue if Reb Menacha Hakoton was a G'dolie Haposkin or not, have some respect for the man, he was able to learni better than all of us put together, and that is enough to be Mechayav you to respect him. >Many of his positions of course were remarkably conservative in halacha too. He did not hold of translations of Shas. He disagreed with rendering rulings over the telephone – especially if the Rav did not have a phone number to call back. What will the Rav do if he realizes that he made a mistake? >His halachic positions were certainly innovative too, if not also controversial. He never recited a bracha on tovelling dishes for fear that the manufacturers were really Jews. Even if there is a majority, how do we really know? >Some of his other positions were even more controversial. He held that giving blood may be a violation of Chovel B’Atzmo. He was the first to argue with Rav Moshe Feinstein zatzal about an Eiruv in Brooklyn. Many a Yeshiva bochur disagreed with his position about street lights acting as a legal type of fence, but all admitted that it was innovative. He also held that Mitzvos cease after one’s death and one does not have the right to give away organs – even if it is Pikuach Nefesh. R' Menashe Klein had many more extremely conservative and controversial psakim, such as the heter to cheat on taxes. Real respect for his life's work means reporting it accurately. When you add to the story (like saying he was THE posaik of the dor or that Rav Moshe ztk"l said he was the greatest of our times you are actually saying that what he really did in his life wasn't enough. I have his sforim and he was a great talmid chocham. I learnth once in his Beis medrash and used an english translation soncino gemorah before artscroll came out. He did not really like it but when he farherd me I knew my stuff thanks to learning it with a translation. To this day I feel guilty using an english translation but then I say to myself if thats the best way for me to learn why not. In the time of the gemorah so many did not speak loshon kodesh so why is it such a crime. For our generation halevai we studied using artscroll instead of so many youngsters tuning in to movies or baseball games. I hope I am right when I get to the next world for using english translations in learning my davening and Torah studys.I have enough sins for some gehenom treatment. Although most Rabbonim, including the Reb Yoel Satmar Rov Zt"l, all held that Brooklyn is only a Karmulos, Reb Menashe Zt"l was at the forefront. “ Thanks for the M'kor from Reb Moshe. it is always good to hear something from a Kli Shieni, something that Reb Moshe said. The whole concept of debating, whether he was or not..is lame. All you need to do, is simply open any noted sefer dealing with halachik p'sakim. from a classic sefer as Sh'mirat Shabat KeHilchato to Piskei Halachot; seforim that every posek uses and are literal household items in terms of halacha, All quote him numerous times. His seforim/psakim will, whether directly or indirectly be a source of p'sak for generations to come. Yehi Zichro Baruch. Who are the men sitting next to Rabbi Menashe Klein? Does anyone know?? We are lucky that our dor was zoche to have him. I love this hesped. Thanks very much to vin - you are always there for us and we appreciate it immensely. You say what needs to be said, you are like a shul, an Agudah, a chessed machine all in one. May you be zoche to gezint, parnussuh and naches from your mishpuchu and all your readers!! I first must acknowledge my personal loss in the great Rav's passing. Not only did I learn in his yeshiva and glean from his insight and personal warmth, but I boarded in his house and his sensitivity was a classic display of Ahavas Yisrael. But I should clarify something about his position about translations and Artscroll in particular, and this I derived from the way he'd speak about it publicly: it bothered him that in America, only a generation after the scholars of Europe had toiled, learning Torah the original way, a movement of spoon-fed study would arise as the rule, not the exception. Of course he saw the value in it and he did have some respect for it, but he was very disturbed by the emergence of the trend that one may cease to study and work hard at a passage of Gemara because it has already been figured out for him. I know he was very controversial in many ways, however, conversely, as ChachoMoe said, his Torah influence has been felt for decades now, and will be felt for generations to come in the Torah world. To all of the am ha artzim who are in any way critical of this tzadik: thank you for showing us how singular he was in his kedusha. Flies are drawn to honey. My father ZL also learned in Ungvar and knew Rav Menashe Klein ZTL as a bochur. He was a good student but wasn't as astounding as a cousin of his who was brilliant. Unfortunately, that cousin who survived the war became a big apikoros and Rav Menashe, blossomed his talents under the tutilage of the Klausenberger Rebbe ZTL and became a profound personality, author and halachic authority. This is a lesson for everyone. It isn't the prime talent which makes the Gedolei Yisroel but the drive-the rotzon.. Rav Menashe ZTL used to say to bochurim- You have a whole day ahead of you- Utilize the time-take the Gemorrah and hakk arein !"